Welcomed by our Kasha staff , shuttle bus to hotel for check in. Wake up call, buffet breakfast. Proceed to visit the Citadel of Salah Al Deen & Mohamed Ali Moseque. Then visit the Egyptian museum. Lunch, shopping at Khan El Khalili Bazzar. Back to hotel and overnight. Wake up call, buffet breakfast. Proceed to visit the Pharaonic village and have lunch there. Shopping, optional visit to Sound and Light Shaw at the Pyramids area. Back to hotel and overnight. Wake up call, buffet breakfast. Transfer to Alexandria for one day trip. Proceed to visit the Greco-Roman museum, Pompeii’s Pillar and Catacomb. Lunch. Spend the rest of the day in Montazah park. Back to Cairo, overnight in the hotel. Wake up call, buffet breakfast. 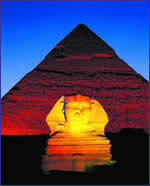 Visit the Pyramids and Sphinx. Lunch at the Pyramids area. Then Continue the visit to Memphis and Sakkara. Shopping. Back to hotel and overnight. Wake up call, buffet breakfast. Proceed to visit the Egyptian museum. After that have a visit to Al Azhar Moseque. 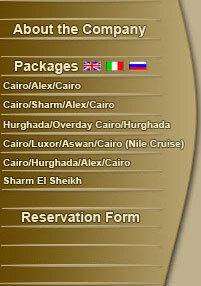 Then have lunch on a 5 star cruising restaurant with a spectacle view of the Nile. Back to hotel and overnight. Wake up call, buffet breakfast. Transfer to Cairo International airport for final Departure.